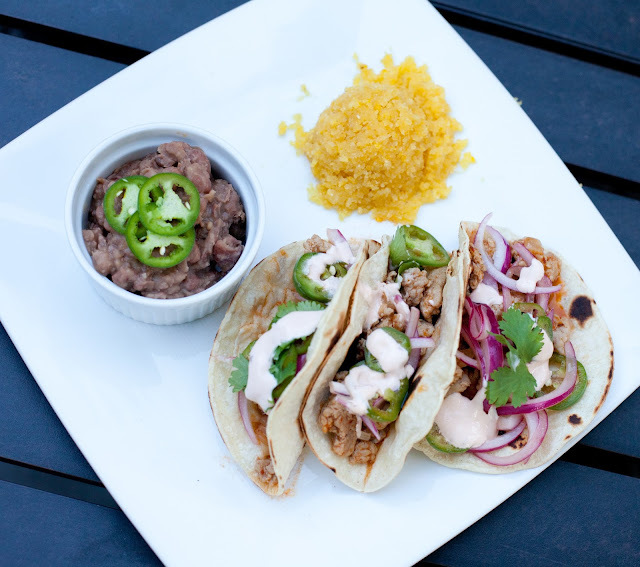 Although husby would be happy if I made the same tacos every single Taco Tuesday, it's fun to switch it up with new recipes and new flavors. 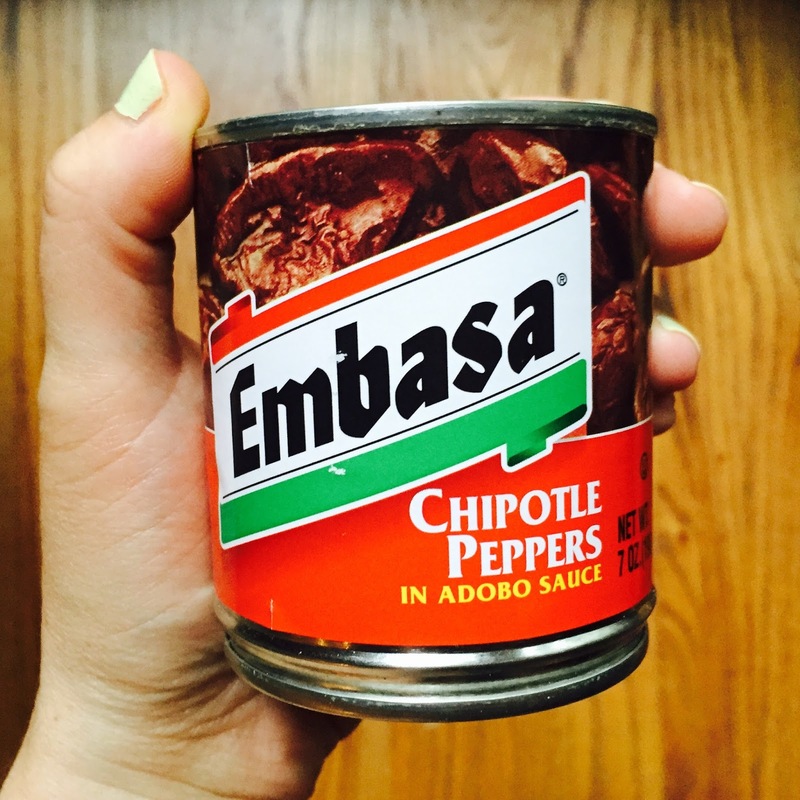 Enter: Chipotle Peppers in Adobo Sauce. The Adobo Chipotle Ground Chicken was adapted from a Rachel Ray recipe in her June magazine. She inspired me to use ground chicken, which I almost never cook with so it was a nice change of pace. While the chicken was browning, I pureed an entire can of chipotle peppers in adobo sauce. I busted out our Baby Bullet (previously used for making baby food), but a small blender or food processor will work as well. You'll only need a couple tablespoons or so to flavor the chicken, so I used a little to make a chipotle crema and froze the rest in a ziplock baggie. After the chicken cooked for a bit, I added the spices, chicken stock, and the chipotle puree, and let it all simmer. Warning - the filling is going to be a bit spicy! 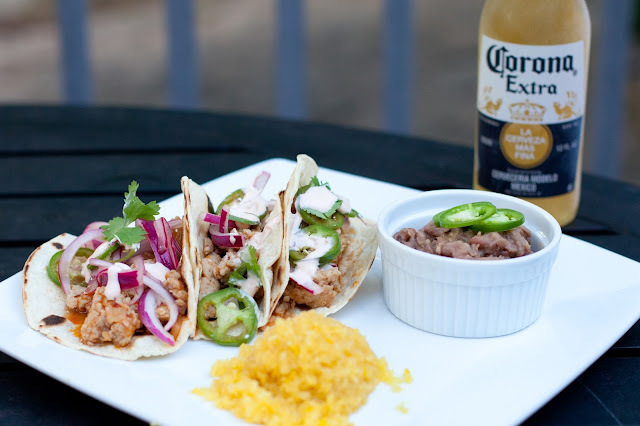 To tone down the heat, try adding less of the chipotle puree. I served the chicken in charred white corn tortillas (I just heated them up on a skillet), and topped the tacos with a chipotle crema (sour cream mixed with a bit of the chipotle puree). However, this was spicy/smoky on top of spicy/smoky. If you want to counterbalance the chipotle sauce, try sour cream on its own. I also added quick pickled red onions and jalapeños (to take the spice down, just pickle the onions). I used our CSA corn and made Mexican Sweet Corn Cake (find the recipe I used here). I had to go to a few different stores to find masa, the very fine, dried, powdered corn used to make corn tortillas. I only used a small amount for the corn cake, so I'm excited to use the rest to make homemade corn tortillas! I also served the tacos with homemade beans. Oh. My. Word. These beans need their own post so come back tomorrow for the recipe! Heat oil in a skillet and brown the ground chicken (3-4 minutes). Add onion, coriander, cumin and cinnamon, and stir. Add chicken stock, chipotle puree and agave. Simmer 10-15 minutes. Add a squeeze of lime before serving. Scoop out as much sour cream as desired into a small bowl. Add a very small amount of chipotle puree and mix. Add more chipotle puree to taste. In a medium bowl, whisk together red wine vinegar, olive oil, and agave. Season with salt and pepper, Add half a red onion and one chopped jalapeño. Let sit, stirring occasionally to mix. this sounds delish! 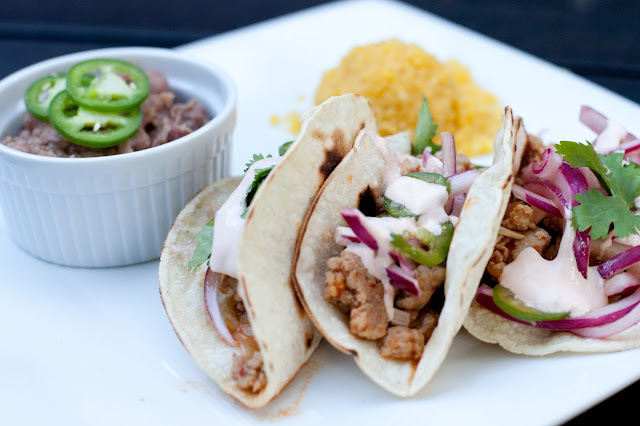 We usually make our tacos with ground chicken or turkey (I love it so much more than ground beef). Thanks for sharing!